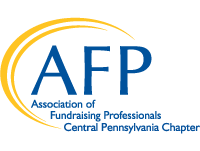 The best way to connect with the local AFP Central PA Chapter is to attend a chapter meeting. Our meetings have a distinct educational focus and feature a variety of speakers. First time attendees are invited for a complimentary session. Join AFP Master Trainer and #productivitynerd, Chad Barger, for a fast-paced session filled with tips (hacks) for fundraisers, executive directors and boards to raise more money, by working smarter, not harder. This presentation focuses on improving both the fundraiser (via personal productivity hacks, e.g. managing time, email, meetings, etc.) and the fundraising (via planning, discovery, cultivation, solicitation and stewardship hacks). Attendees will discover their own personal productivity style and have a chance to share what works for them as @fundraiserchad crowd sources even more tips from the audience. You’ll leave this workshop energized and with 50+ ideas on how to fix your productivity to amp up your fundraising results. New Location and New Format! Tentative Educational meeting dates for future meetings include June, August Webinar, Fall, December (luncheon). Note: Some date changes will apply based on availability of speakers. Always check the website/announcements for verification of an event.